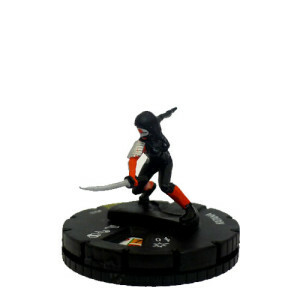 The figure used for this unit is a Heroclix figure from the Justice League Trinity War set. Its model number and name are #004/Katana. Character Bio - Katana is a sword-wielding Japanese super-hero with magical weaponry. Her blade is the Soultaker Sword, a relic that steals the essence of those it slays and stores them inside. It was taken in a duel with the man who killed her family, Takeo Yamashiro. Batman eventually recruited her to become a member of his black-ops team the Outsiders during a mission in Markovia. She has also been a member of the Birds of Prey, and once helped the Suicide Squad as requested by a family member of her deceased husband(originally she declined on the basis of her giri-ninjo, although she was willing to help if the need was truly desperate). As a Human, Katana has these Human Synergies. As a Human, Katana interacts differently with certain special powers. Special powers that Interact Differently with Humans. Androids, Constructs, and Undead are not affected by Katana's Soultaker special power. Current Androids, Constructs, and Undead. Using Bladerunner, Katana can get through tricky figure placements and pods by moving through figures and avoiding leaving engagements. 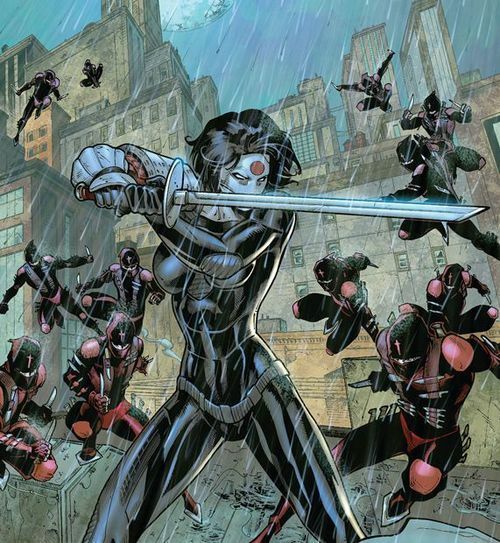 With her Soultaker and Defensive Arts, Katana works well with stat boosters such as Captain America, Star-Lord, and Invisible Woman. 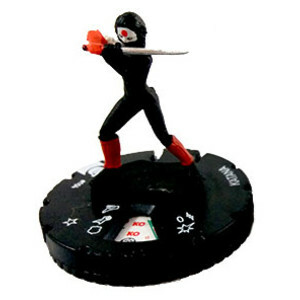 Katana's Soultaker can allow her to -2 from her opponent's initiative for each figure on her card, but it also helps her break through certain figures with defensive specials that rely on a 20-sided die roll. An example of some of these figures would be Daredevil, Gorgon, Spider-Man(Peter Parker), and Venom etc. As a figure without Superstrength, Katana is a nice option for Enchantress's Enchantment special power. Katana may move through all figures, never takes leaving engagement attacks, and may attack with her normal attack up to 2 times at any point before, during, or after her normal move as long as she is on a space where she could end her movement. Adjacent figures subtract 2 dice when defending against Katana's normal attack. When Katana destroys an opponent’s adjacent Unique Hero that is not an Android, Construct, or Undead, you may place that figure on this card. When an opponent rolls the 20-sided die for initiative or for a figure attacked with Katana's normal attack, you may subtract 2 from the roll for each figure on this card, to a maximum of -6. When defending against a normal attack, add one automatic shield to whatever is rolled and, if the attacking figure is adjacent to Katana, all excess shields count as unblockable hits on the attacking figure. Last edited by Arkham; March 15th, 2017 at 10:06 PM. Last edited by Arkham; March 4th, 2016 at 02:06 PM. There's much better comic art of her black/white/red look, so I'd probably prefer one of those figures(A or C), but option B is probably the best sculpt. Is it required that the comic art match the figure's appearance, outfit wise? It's not required to have figure and comic match, but it's generally preferred. I like the "red sun mask" style personally, but I don't know the character well. Overall I think the design could use some trimming. Soultaker is the money power here, but the other two could be trimmed - I'd probably swap Melee Strike for Engagement Strike, just to limit the amount of die rolling on her turn and drastically simplify the wording there. What does her range represent? Shuriken? Also, not sure if Ruthless fits... but again, not super well known. The range represents her proficiency/marksman with ranged weapons. She's known to bring shurikens and a bow etc. for backup. Engagement Strike vs. Melee Strike, as far as I'm aware that's a power you guys came up with. So I'm not entirely tied/attached to either or. I'm digging her power set. I don't find her overly complicated at all. She's simpler than a certain Street Fighter I looked at this morning, for instance. And rolling the D20 often is part of her design concept. Batman and the Outsiders! My only concern is that with 4 Life, 5 Defense, and no defensive power, she's going to be fairly easy to kill without defensive back up. So I suspect she'll be a good deal less than 230. Maybe 170-190? Speaking of, I'm thinking maybe a defense of 6 would be more appropriate? She's a skilled acrobat, high agility, near unmatched stealth, highly skilled martial artist, and she wears an outfit with padded and armored sections for protection. So perhaps a defense of 6 would be a better representation of those skills? We could probably still come in around 190. "She is a great leader and has a brilliant tactical mind, being able to tell others how to use their powers to the fullest in any situation." Perhaps we instead give her a leadership/synergy benefit of some sort to offer teammates? Just an idea. If not, I'm cool with the Engagement/Melee Strike of course. I'm willing to hear other ideas for the third power for sure. I do hope she retains a D20 connection of some sort, though. Personally, there's just too much going on here that drowns out a lot of good stuff going on. I like Bladerunner, but that's three powers condensed into one; if we can trim elsewhere maybe we could break it up more. I'm not a fan of Melee Strike; there's already quite a bit happening on her turn with Bladerunner and her SA, this just adds too much. Also considering how many thematic powers are being cut (MMA, a stealth power, a tactician power) I just can't justify including Melee Strike. Soultaker is the big power here, but it feels weird to me as an SA. Honestly, I think it would work as a part of her normal attack just fine. Katana never takes leaving engagement attacks, and may attack with her normal attack up to 2 times at any point before, during, or after her normal move as long as she is on a space where she could end her movement. Figures attacked by Katana's normal attack roll 2 fewer defense dice. When Katana destroys a Unique Hero with her normal attack, you may place it on this card if it is not an Android, Construct, Undead or destructible object. When an opponent rolls the 20-sided die for initiative or for a figure attacked by Katana's normal attack, you may subtract 1 from the roll for each figure on this card, to a maximum of -6. Then add in a third power and adjust her stats accordingly. MMA would be thematic, but that would probably put too much into her normal attack; maybe just bump her stats and give her Counterstrike? Or Camouflage from A-Bomb? Maybe a D20-based tactician power? Speaking of, what's the reason behind wanting a D20 roll on her card? I know before we wanted it so Batman (III) could boost her, but since Interloper was removed from his synergies that doesn't seem relevant anymore. Anyways, that's my . I like the character and like the direct the design is going, it just needs some refining in my opinion. 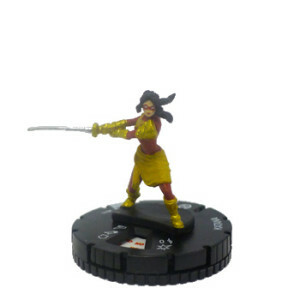 When Katana attacks an adjacent figure with her normal attack, add one to her attack and the defending figure rolls 2 fewer defense dice. If Katana destroys an adjacent Unique Hero with her normal attack, you may place it on this card if it is not an Android, Construct, Undead or destructible object. When an opponent rolls the 20-sided die for initiative or for a figure attacked by Katana's normal attack, you may subtract 1 from the roll for each figure on this card, to a maximum of -6. As for a 3rd power, I'd be fine with something either stealth or tactical related. I'm sure we can find a way to encorporate a d20 roll intro either. The D20 isn't necessary, but it would be a fun synergy with Batman (III). Even without direct Interloper synergy, he still boosts any D20 roll he wants. I like the trimmed Blade Runner. I think we'd want to boost her attack to 4 with that, though. I'd say 5, but not with her having range. To me, Melee Strike is a cool, unique way of representing her fighting prowess. It covers the same thematic area as MMA in a different way. I'd be cool with any of Counter Strike, Melee Strike, or an interesting D20-based Tactician power for her third power. Not feeling a camouflage power for her.